As we all know that OnePlus has been collaborating with popular brands such as Lucas Film for Star Wars Edition, Marvel Comics for Avengers Edition and few others. You get to see this collaboration on the smartphone when it has some new back panel or having a small logo somewhere on the phone. Now, the company has announced a new partnership with automobile giant McLaren with a teaser clip. So what we expect from this collaboration is, OnePlus 6T McLaren Edition. The OnePlus tagline is known as 'Unlock the Speed'. But in the final moment this has been changed with new tagline 'Salute the Speed' highlighting the in-screen fingerprint sensor. This means that we will definitely be looking for new back panel, probably with raven-hued carbon fiber along with Mars surface red-hued accents on camera modules and inside. The user-interface will have special themes, wallpapers, and also collectable key chains as part of the retail box to match McLaren's F1 cars. 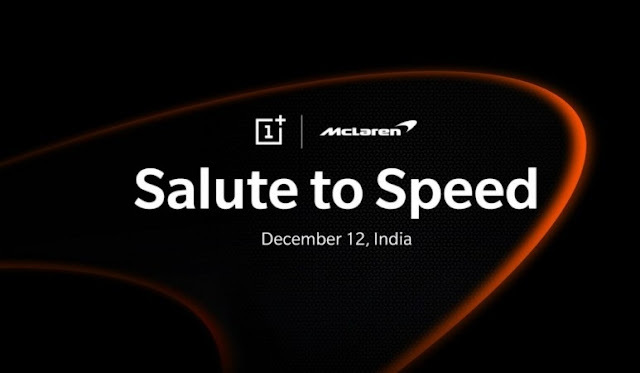 It can also be noted that OnePlus will hold the event first on December 11 at McLaren Technology Centre in the UK. OnePlus 6T McLaren tipped to debut in India on 12 December. Rest of the internal hardware of the OnePlus 6T McLaren Edition is expected to be same as the original model. OnePlus 6T McLaren Edition is expected to flaunt a 6.41 full HD+ Optic AMOLED screen with 2.5D Corning Gorilla Glass 6 series shield on top and to power the massive screen, it comes with 3,700mAh battery, 400mAh more than the OnePlus 6 (3,300mAh). It also boasts Fast Charging (5V 4A) technology. In addition to the face unlock feature, it will also come with in-screen fingerprint sensor.